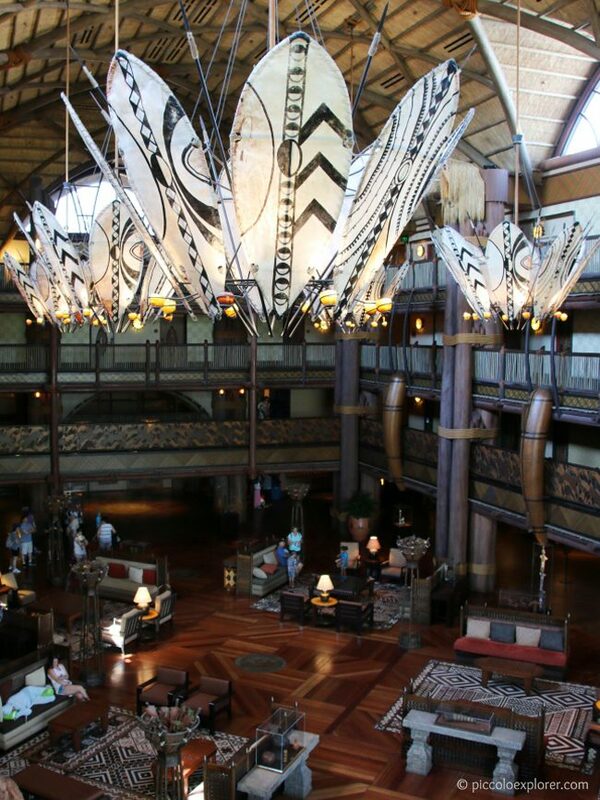 Disney’s Animal Kingdom Lodge is a Walt Disney World resort inspired by traditional African savanna lodges and brilliantly themed with the adjacent Animal Kingdom theme park. 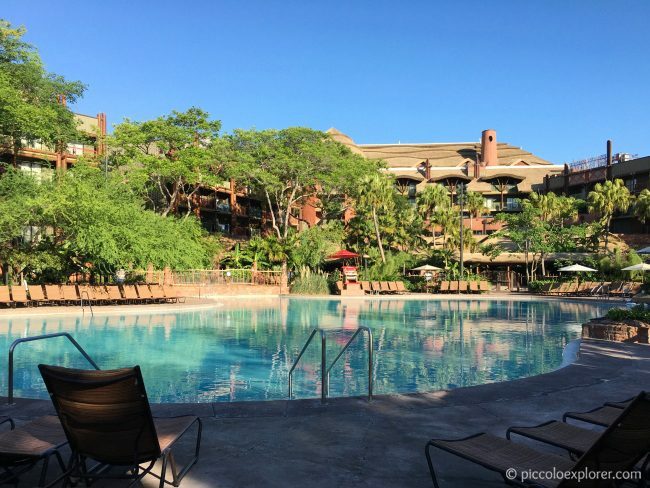 We stayed at the Animal Kingdom Lodge for our first visit to Disney World in May 2017 and thoroughly enjoyed the unique experience at this deluxe resort. 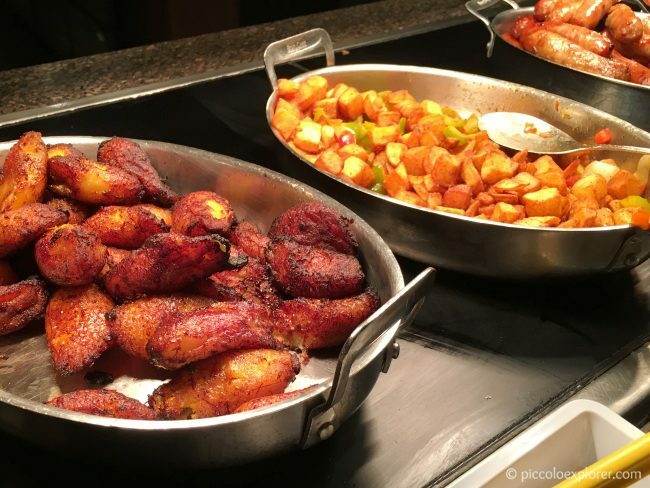 At Disney’s Animal Kingdom Lodge, you’ll find family-friendly facilities, outstanding cultural activities and animal programs, and rooms overlooking four savannas with over 200 animals and birds. The resort’s lobby has been designed to capture the look of an African savanna lodge. 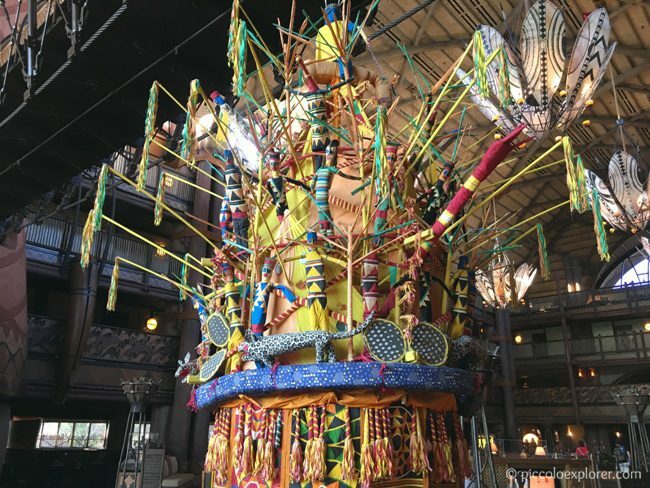 The Animal Kingdom Lodge has one of the largest collections of African art in the United States, with traditional decor, tapestries and artwork displayed throughout the resort. 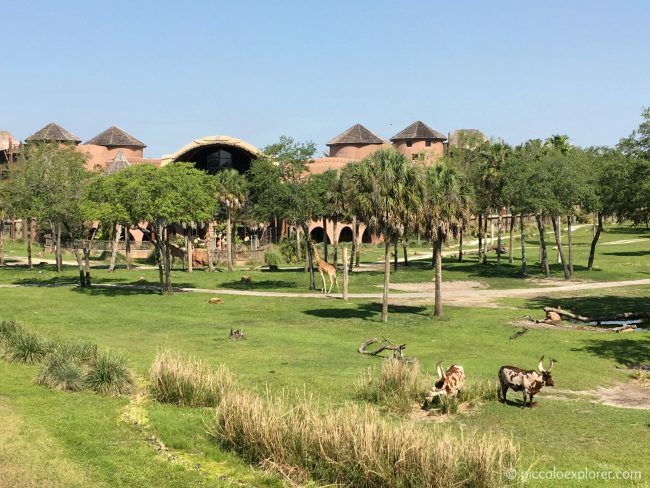 The Animal Kingdom Lodge is arranged in a horseshoe design, with rooms and public areas that overlook the 33 acre wildlife preserve where over 30 species of African species graze and roam about. 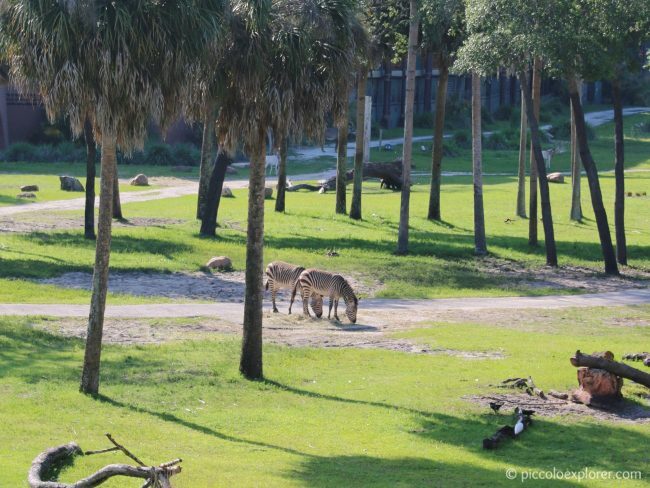 It’s worth booking a Savanna View Room to enjoy the view of the animals from your balcony. During our stay, we’d head out to watch giraffes, zebras, cattle, gazelles, cranes and more. Each room has a guidebook to help with identifying the animals and birds. We stayed in a standard Savanna View Room, which is 344 square feet, with two queen beds. Other options are to have one king size bed, or one queen size bed and a bunk bed. The room also included a small table with chairs, a flat screen TV, a dresser with three drawers, a small refrigerator, coffee machine and a wardrobe with an iron, ironing board and small safe. The bathroom has a split design, with the vanity and two sinks outside the small room that consists of a toilet and shower with a bathtub. Complimentary Disney toiletries (shampoo, lotion and shower gel) were provided, but only enough for one person. 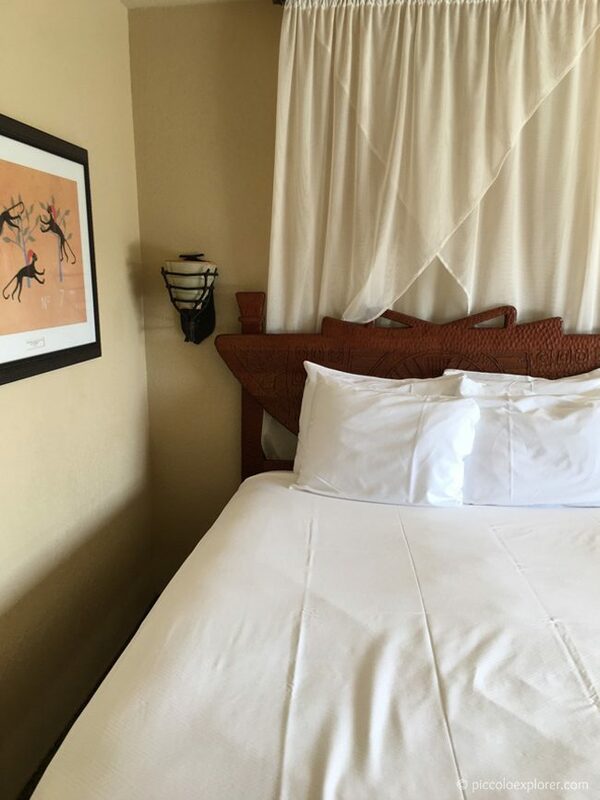 Overall, the standard Savanna View Room was a comfortable size for the three of us and we enjoyed our stay, especially the great view watching the animals from our balcony. My only complaint would be that housekeeping was inconsistent and we were often missing certain items – clean coffee mugs, some towels, new toiletries. We also had two days when we’d return to the room in the late afternoon to find that housekeeping still had not tended to the room, and we ended up having to skip those days. 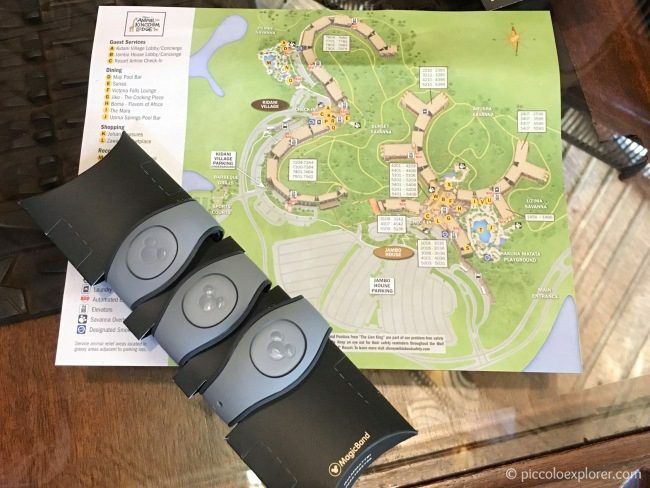 The Magic Bands are worn as a bracelet and are used to unlock your hotel room, enter theme parks, check in for FastPass+ reservations and charge food and merchandise purchases. I found the Magic Bands very handy throughout the trip especially at the parks. 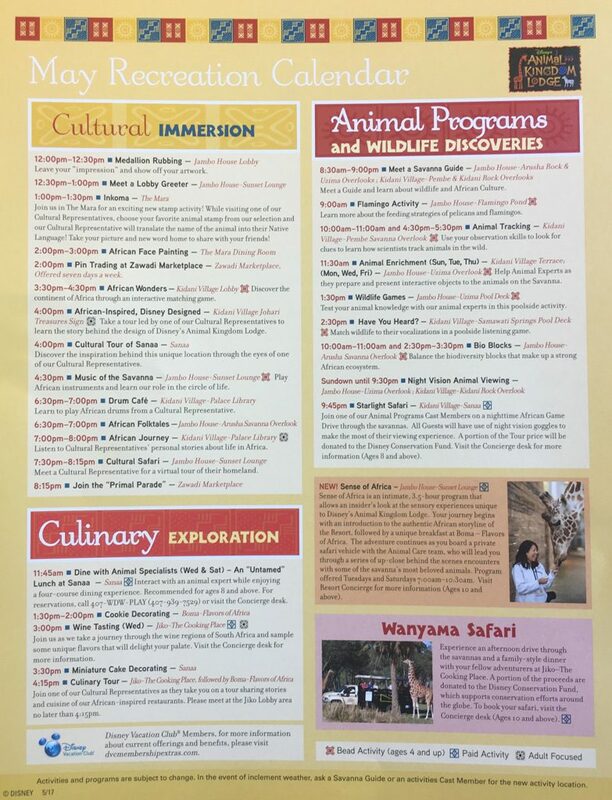 The Animal Kingdom Lodge has two areas: Jambo House, the original resort and main section, and Kidani Village, a Disney Vacation Club resort. Resort guests can use the facilities, i.e swimming pools and fitness centers, throughout both areas and a shuttle van goes back and forth between the two every 8 minutes. 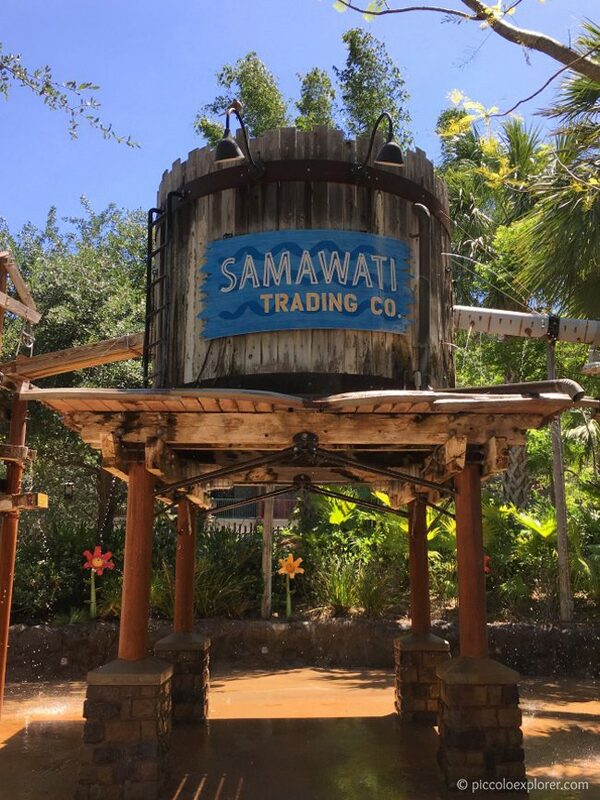 At the center of Jambo House’s recreational area is its main swimming pool, featuring a zero-depth entry point, a 67-foot-long waterslide and nearby beach bar. A small wading pool, perfect for toddlers, is located in an enclosed area to the side, near the restrooms and showers. 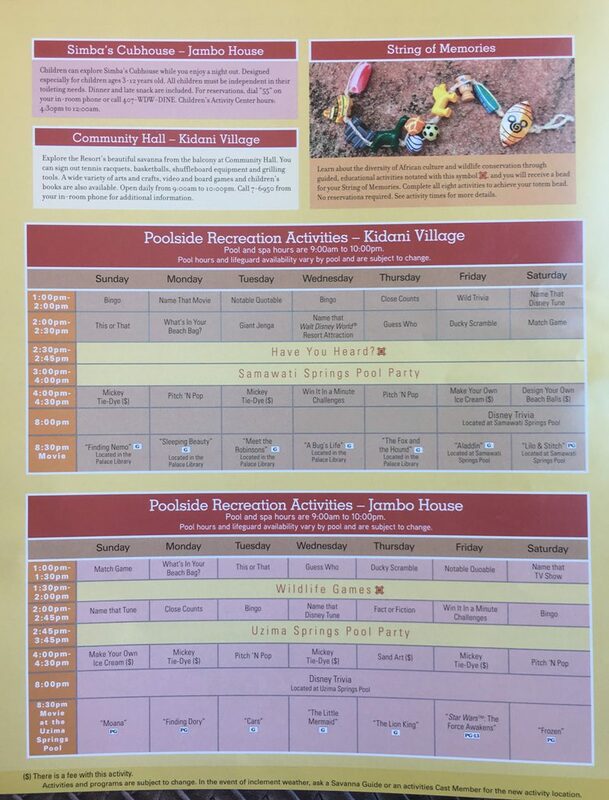 For young children, I’d recommend heading next door to Kidani Village for its Samawati Springs Pool and Uwanja Camp water playground. The swimming pool features zero-depth-entry and two waterslides – a small one and a 128-foot one. 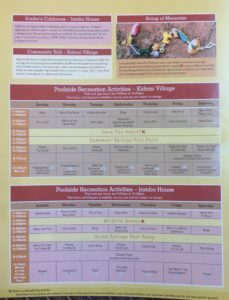 Uwanja Camp consists of three zones for children of all ages. Base Camp has a water slide, water cannons and sloshing buckets. At Departure Zone, water shoots from all directions, leaking from the water tower and spraying from the flowers. And Observation Station is designed for children 4 and under, with a shallow wading pool, bubbling geysers and a play area. 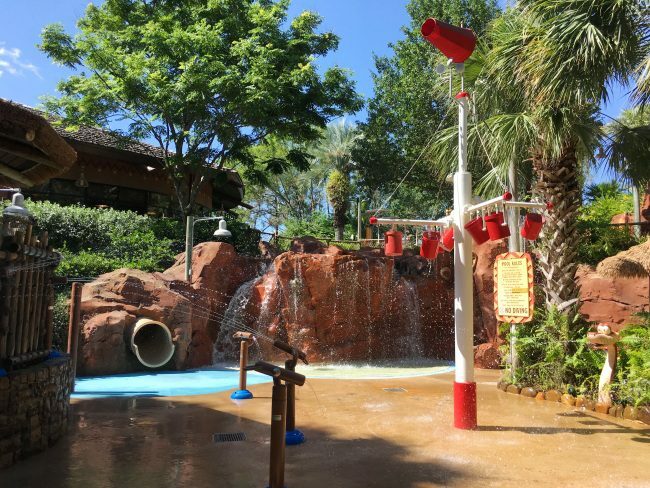 It all makes for a great little water park at the resort that Little T loved! 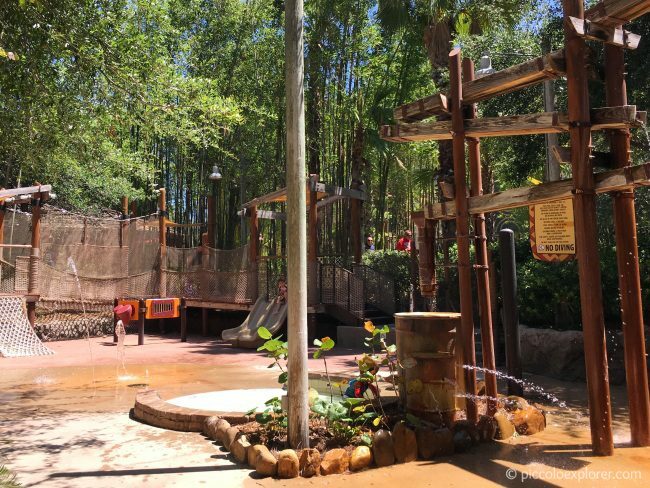 Back at Jambo House, children will also love the Hakuna Matata playground that overlooks the flamingo pond and savanna. 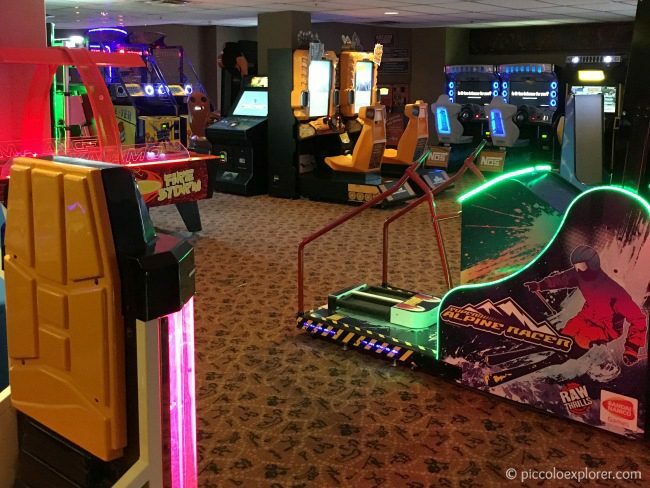 The arcade is open from 7am and full of classic arcade games and popular video games. You can use your credit card to receive an arcade card and purchase play points, which start from $1.00 for 50 play points. The resort has a fitness center which, though small, has all the basic equipment – cardio machines, some free weights and weight machines – to get a good workout during your stay. There’s a spa that offers a range of massages and facials. There are a few laundry rooms around the resort that are efficient and easy to use. You select a washer and/or dryer then pay $3 per each load using your credit or debit card (not the Magic Band or cash). 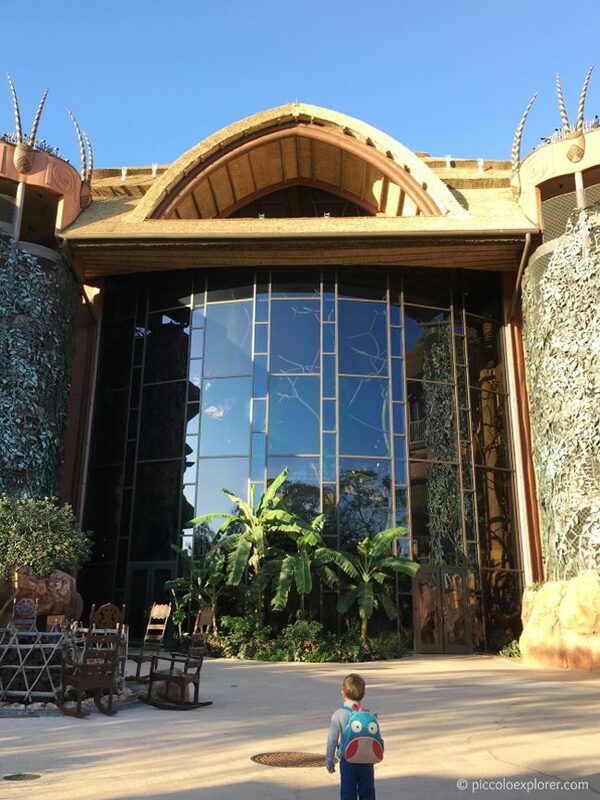 The Kid’s Club at the Animal Kingdom Lodge, Simba’s Cubhouse, is open from 4:30pm to midnight, for children aged 3 to 12 years old. It is set up as a supervised free play space with plenty of toys and dolls, coloring and crafting, and TVs with video games for older children. Cultural ambassadors stop by to involve the children in a fun educational activity before dinner. 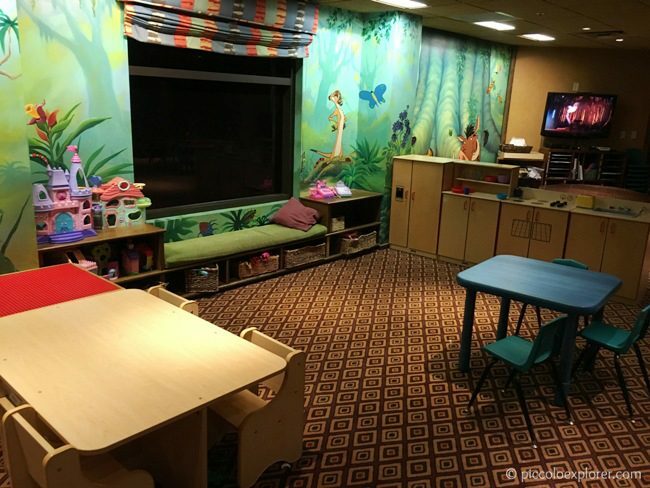 There isn’t a quiet room for children to rest or sleep, and instead there’s an area with bean bags in front of a TV. Not ideal, however, the resort also offers in-room babysitting services if you’re looking for late night childcare for a young child. We picked Little T up in time to go to bed. The price is $15 per hour for each child, with a minimum of 2 hours. Children must be potty-trained (no pull-ups). 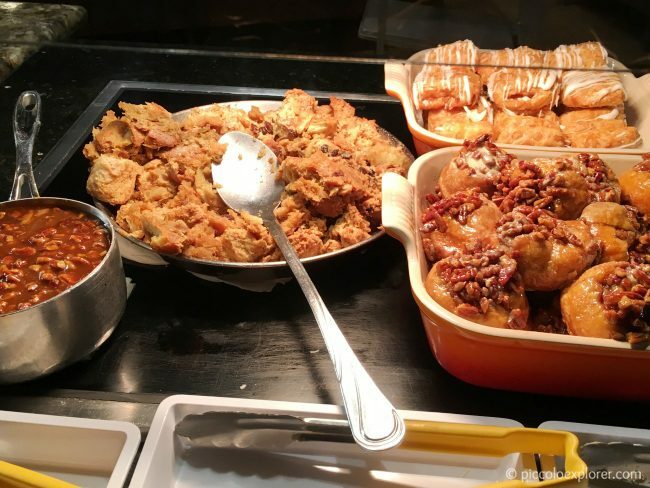 Meals are included and served between 6pm to 8pm, with options including turkey sandwiches, chicken fingers, hamburgers or cheeseburgers, and macaroni and cheese. Snacks include apple slices, yogurt and unsweetened applesauce. 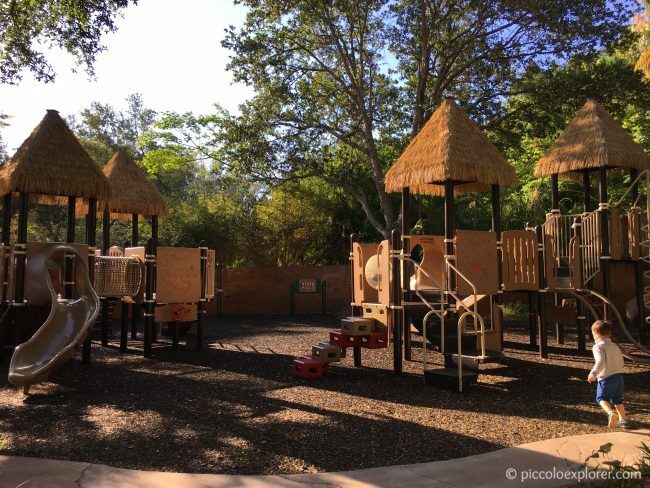 We booked Little T one evening at Simba’s Cubhouse and he really enjoyed it. He loved learning about frogs with the cultural ambassador, using a sticky hand to catch bugs, and did lots of arts and crafts, such as making a cardboard giraffe on wheels. During our visit, there was also an offer of a free hour if you show a dinner receipt from Sanaa, one of the resort’s restaurants. 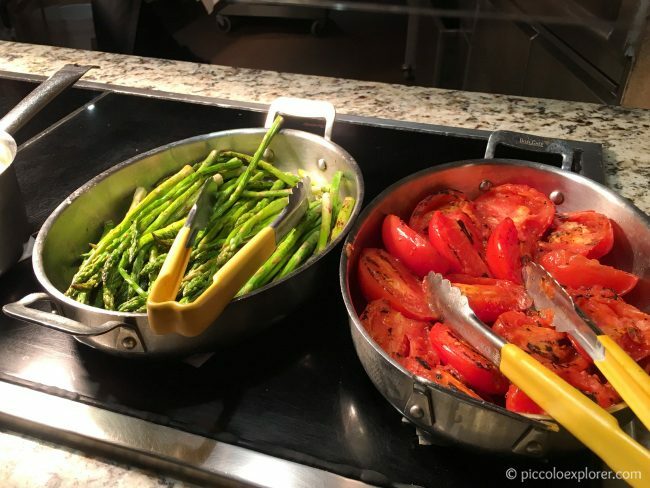 We participated in three activities: helping to prepare food for the savanna birds, learning about the feeding strategies of pelicans and flamingos, and playing musical instruments and participating in the evening “Primal Parade”. The cultural ambassadors and animal experts were all very informative, friendly and did a fantastic job engaging the guests in each activity. I highly recommend making time to get involved with the many activities on offer at the resort. 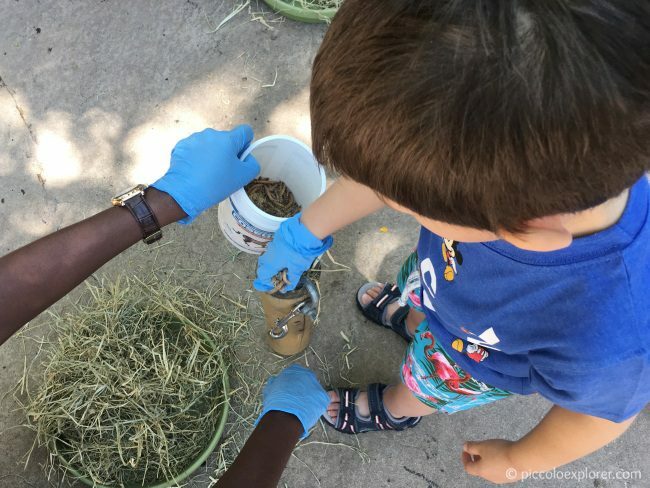 The Animal Enrichment activity we participated in involves helping animal experts as they prepare and present interactive objects to the animals and birds on the savanna. 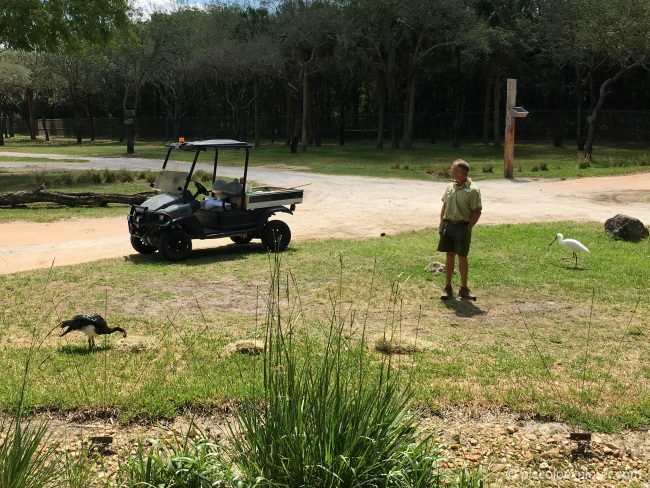 Little T helped the experts prepare a stimulating way for the savanna birds, such as cranes, to catch their food. The children were given trays and bamboo sticks with holes to fill with hay then mealworms. We then watched as an animal expert brought the bamboo sticks and trays into the savanna for the birds to peck at and catch the worms. 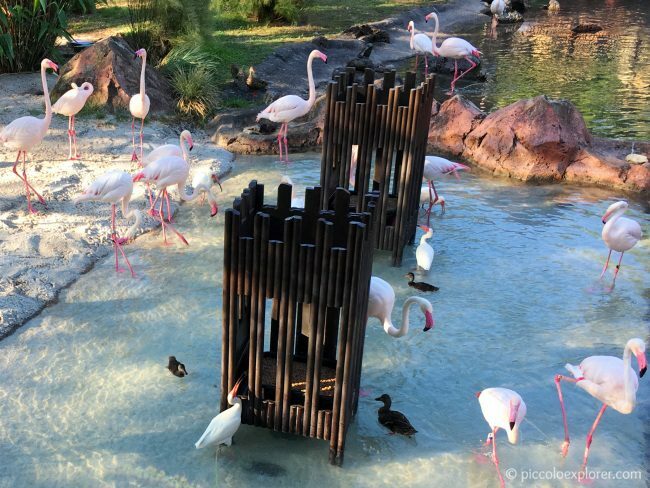 Every morning, by the flamingo pond, the animal experts demonstrate the feeding strategies of pelicans and flamingos in a fun, educational activity. Here, the children use combs to represent flamingos that feed by filtering shrimp from the water, while pelicans are represented with pouches to demonstrate how they dip their large beaks into the water to scoop out fish. 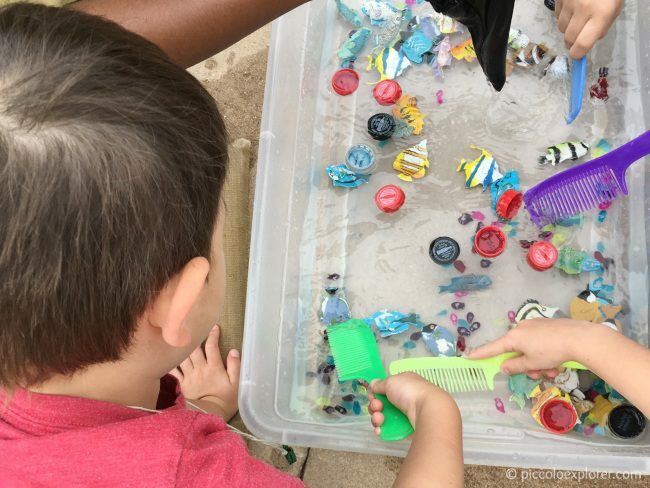 Part of the activity also educated about the importance of protecting the environment, and how birds are endangered by pollution when rubbish ends up in the waterways and is accidentally eaten. 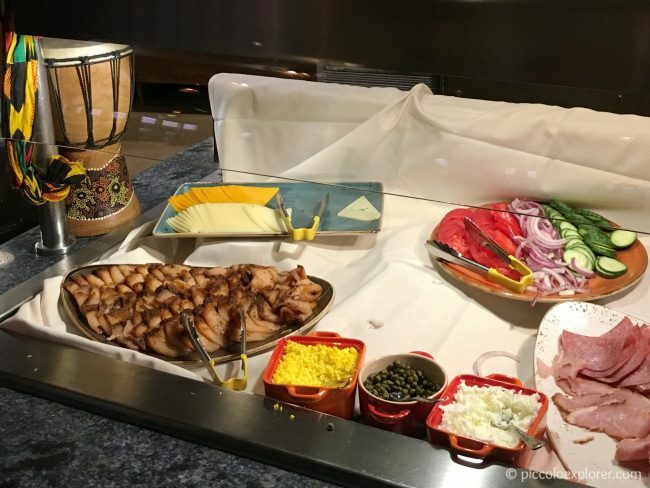 The Animal Kingdom Lodge offers several dining options, from award-winning, African fine dining to quick service restaurants serving class American favorites. 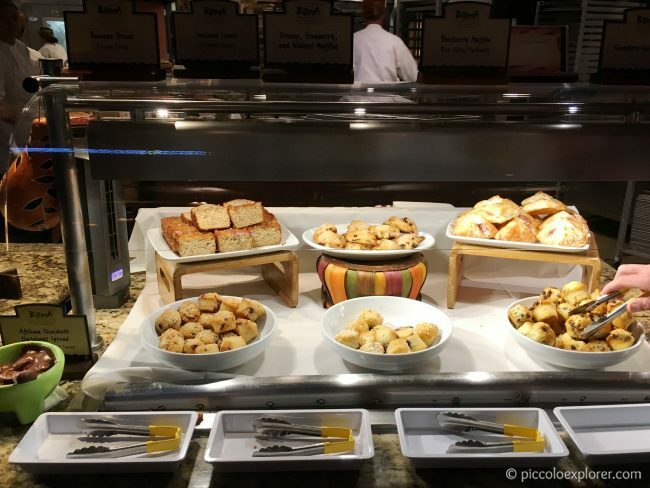 The highlights for us were the breakfast buffet at Boma and the African cooking with Indian flavors at Sanaa. We ate very well at Sanaa, which is described as an East African-inspired eatery serving African cooking with Indian flavors. 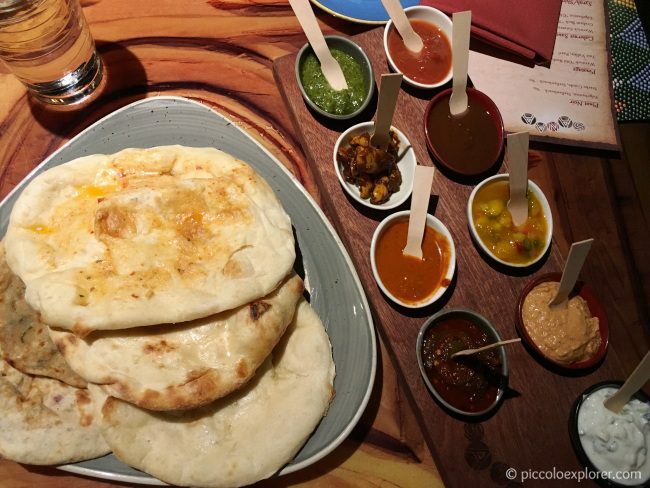 The Indian-style bread service came highly recommended – it comes with 9 accompaniments that include mango chutney, roasted red pepper hummus, spicy jalapeno-lime pickle and red chile sambal. 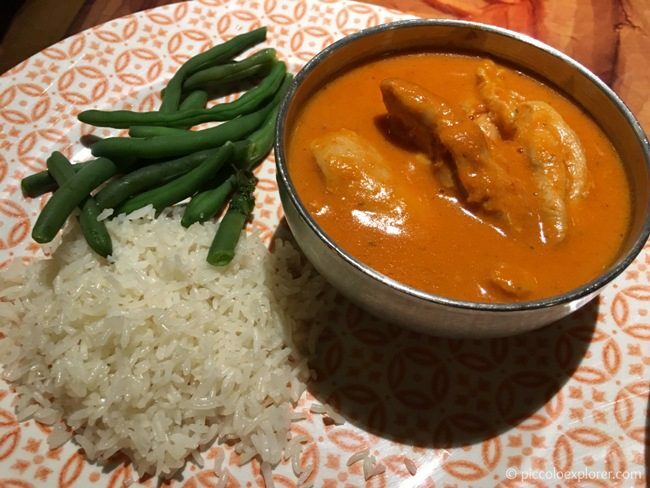 The kid’s menu has a good selection – for Little T, we ordered the butter chicken with green beans and rice. The butter chicken was delicious. 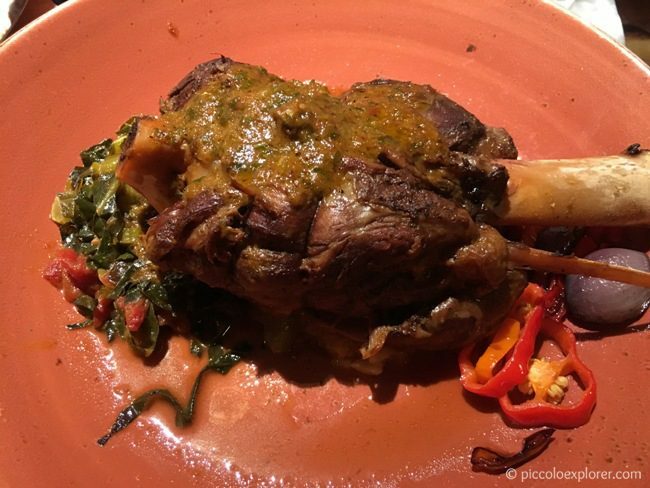 I ordered the Berbere braised lamb shank, which was served with hominy mash, scented greens and tandoor vegetables. 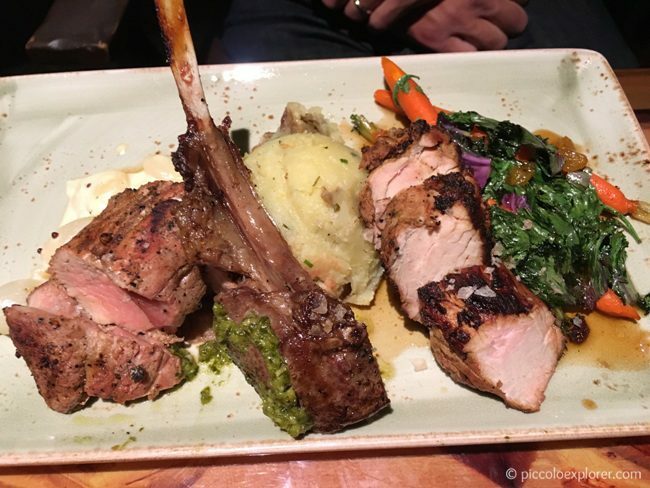 Mr. G enjoyed the Braaivleis – South African Braai sample plate which consisted of a trio of grilled meats – lamb and pork – with seasonal vegetables. 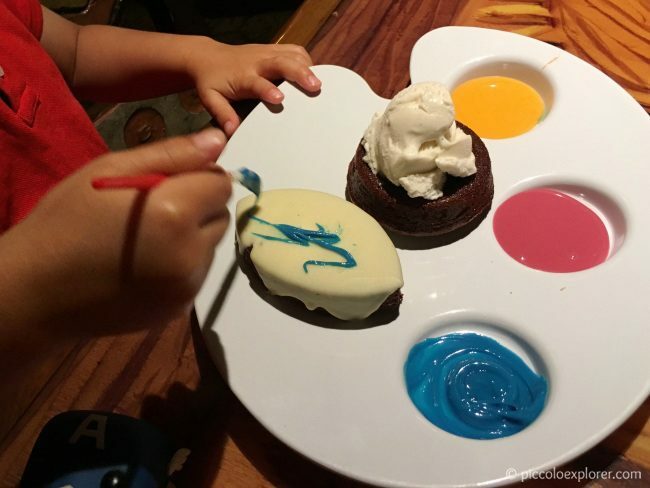 Little T’s meal came with a dessert, and he chose the chocolate brownie, which was served on a plate with colored icing and a paintbrush – a nice touch! 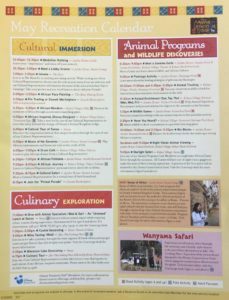 I would recommend the Animal Kingdom Lodge for a unique Disney World resort experience with family-friendly facilities, great restaurants and an excellent activity program with fantastic cultural ambassadors. My only complaint would be the occasionally disappointing customer service, particularly at reception (where we first booked into the wrong room – which still had a guest in it) and with housekeeping. 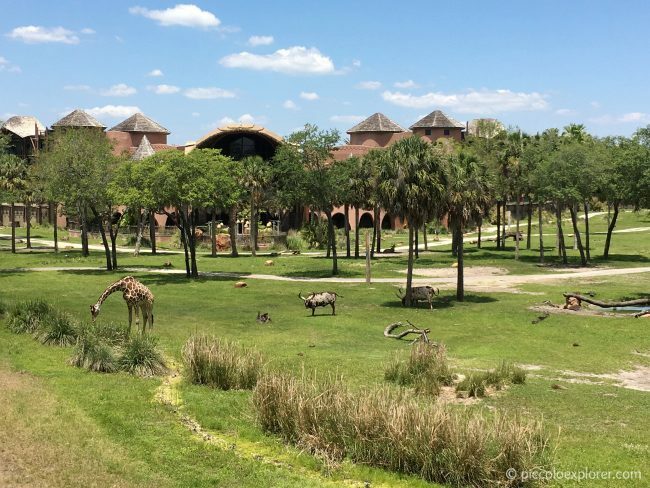 Otherwise, we were very pleased with our stay at the Animal Kingdom Lodge and miss those views watching the giraffes and zebras from the balcony! 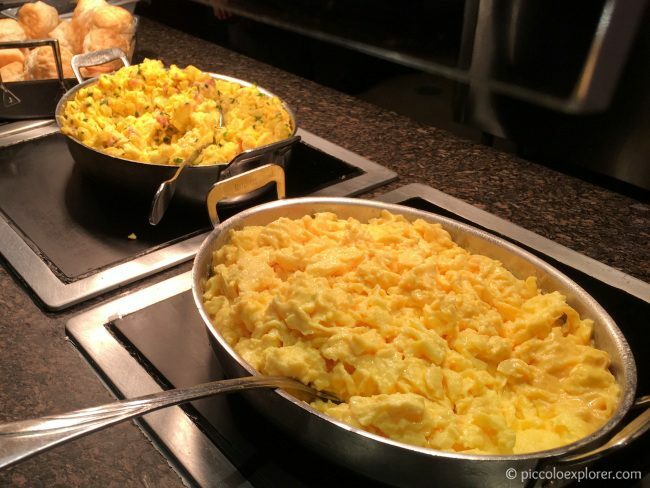 Oh wow, that breakfast buffet has got my mouth watering…And I have to say, I’ve never stayed in a hotel with a view of giraffes and zebras! I never made it to Animal Kingdom when visiting the parks in Orlando. Looks great! Thank you! It was actually between the Beach Club and Animal Kingdom Lodge for us too. 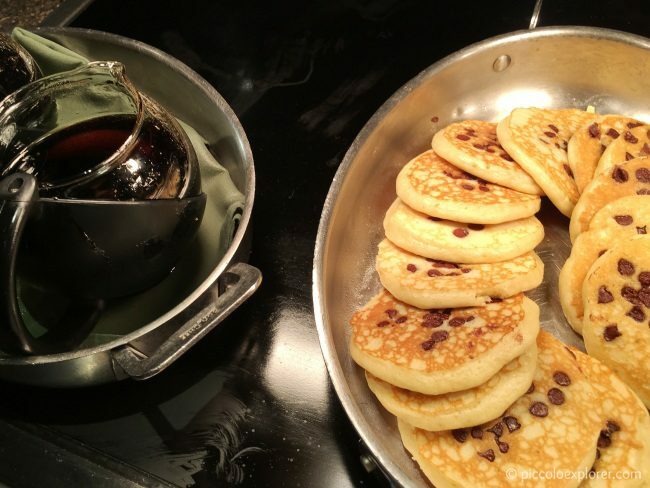 We had breakfast at the Beach Club to meet Minnie etc and I loved the pool, resort design and that it’s walking distance to Epcot, so we’re actually considering staying there next time we go to WDW to try somewhere new. So many great resorts to choose from! WOW. 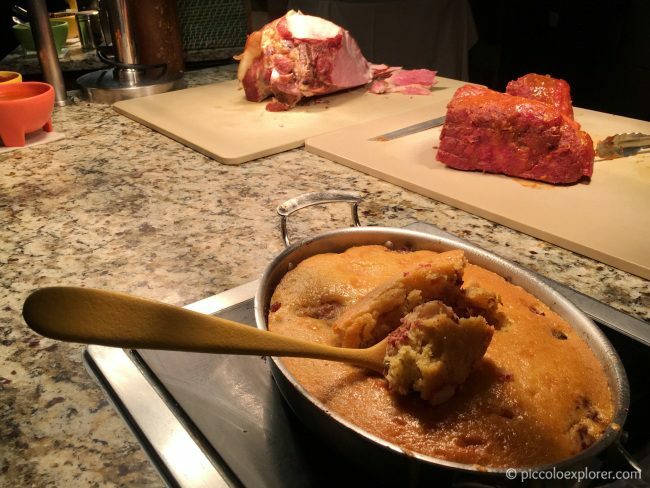 Great review and photos! I loved Animal Kingdom (just came back from vacation) and seeing a resort on site is great insight for a future trip. I hope you and your family had an incredible time! 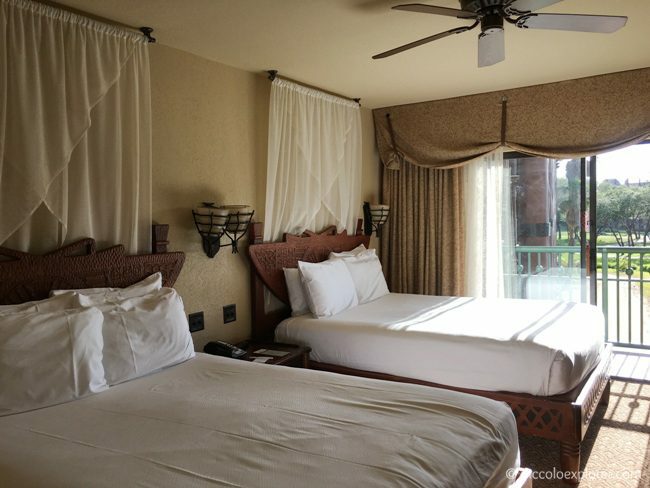 would you recommend staying at Jambo or Kidani.. I’m travellign with my 3 year old, my husband and his parents. 3 days, 4 nights. Thank you! Hi Andrea, thanks for your message. I think Kidani Village only offers villas for Disney Vacation Club members, might need to double check that. 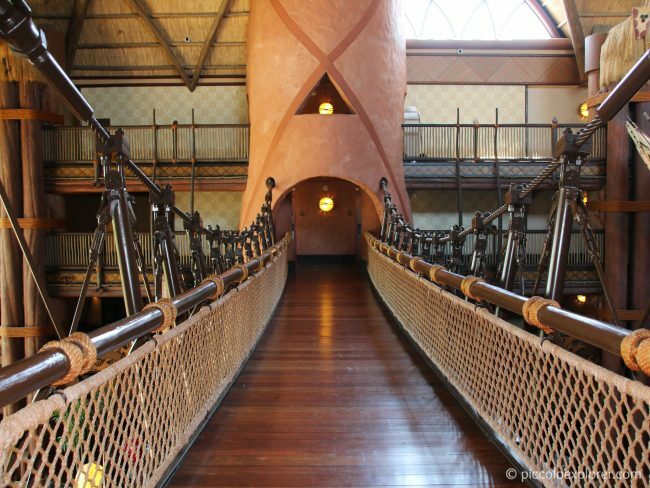 I’d recommend Jambo House – it’s also the main area, with most of the restaurants, facilities and activities. 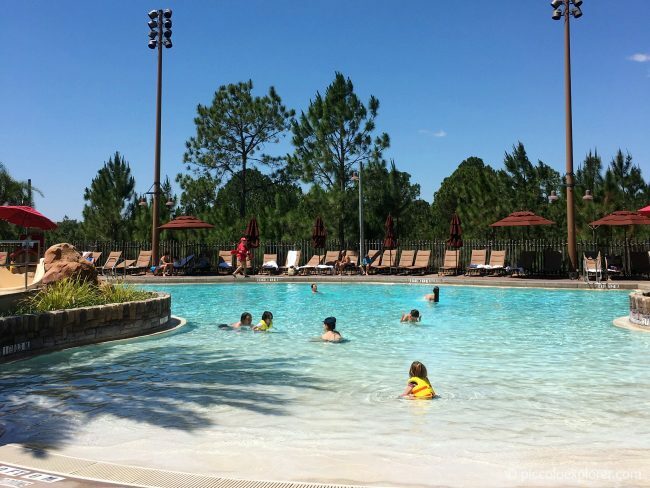 Your son will love the swimming pool at Kidani Village, however, and you can take the shuttle between the two areas. 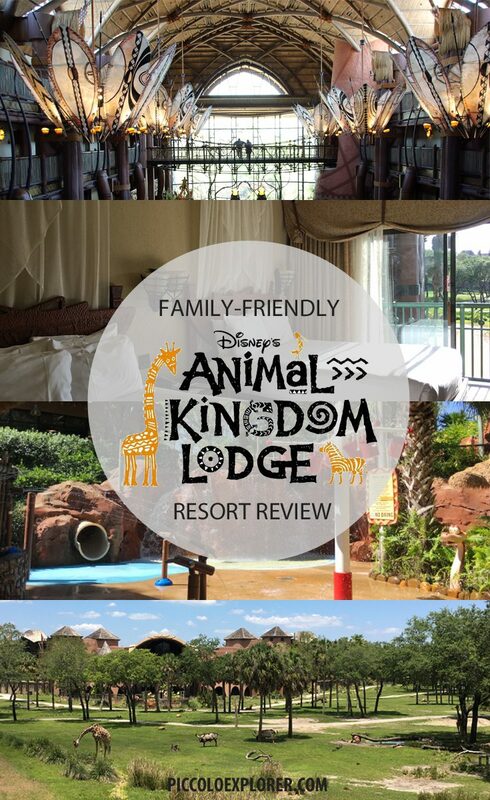 Enjoy your stay at the Animal Kingdom Lodge! And definitely make some time for the cultural activities, the evening parade playing musical instruments by the entrance is great for young ones! You’re welcome! And sorry meant to put son “or daughter”! Good luck with planning your trip! Awesome review! We will make it a priority to do the animal feeding activity. 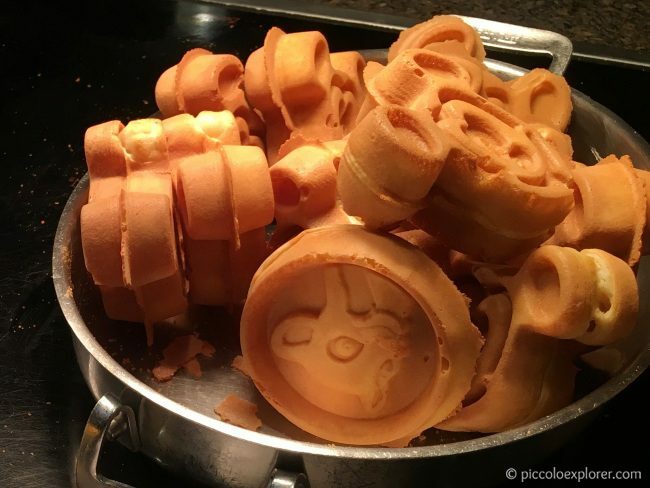 I think my daughter will love it! The flamingo game looks really fun too. Can’t wait to be in 10 days… eek!